My second baby, Dante, was sitting in his baby bouncer, enjoying the excitement of the fresh breeze and dappled sun. The world was still new and there was so much to explore. Suddenly, his older brother, keen to share his exotic bounty of a chocolate biscuit, bounded over and shoved it into the unsuspecting mouth. What joy! Dante's first taste of solid food and a chocolate biscuit to boot. Hmm, sadly chocolate is not on the list of first foods for babies. He had to wait several months for his second luxurious taste. There are certain foods that young tummies aren't ready to eat yet, namely salt and sugar. The best foods for your baby are home cooked and lots of fruit and vegetables. Try to steer away from packets, even 'healthy' packets. 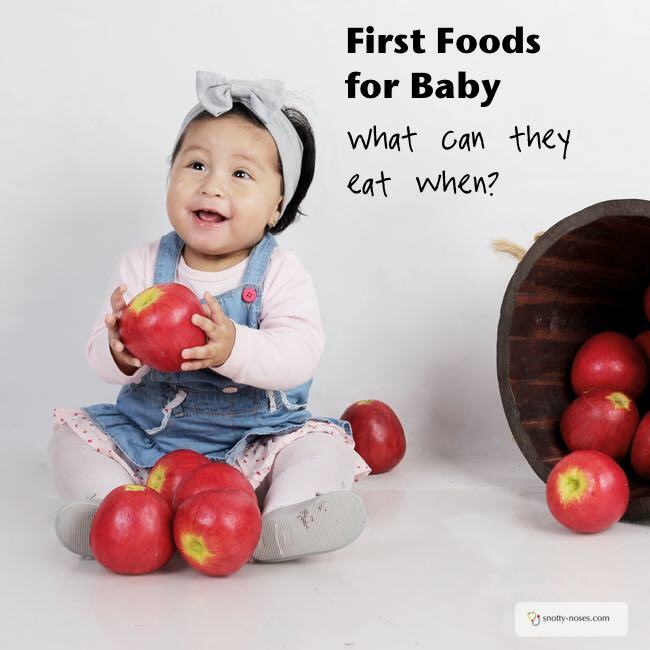 It's great for babies to explore new tastes and textures and to learn what REAL fruit and vegetables are. 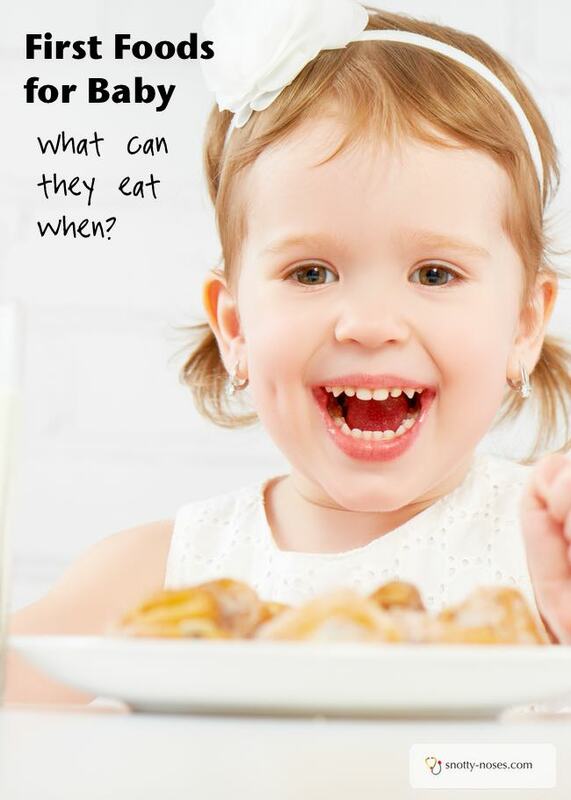 Introduce them to healthy food now and watch them grown into strong healthy eaters! The advice used to be that if your family had a strong history of food allergies, then you shouldn't give certain foods such as nuts and gluten a while after you had started to introduce solids. Now, it is becoming apparent that withholding foods doesn't reduce the likelihood of your child being allergic to it. In fact, the opposite is thought, that if you wait, you are might increase the chance of allergy. If you are worried about your child being allergic to foods, it is an idea to introduce them one at a time. That way if they do show signs of allergy, you’ll be more likely to know what caused it. Breathing difficulties. If your child has breathing difficulties, call an ambulance or seek immediate medical care. Red blotchy rash, especially around eyes or mouth. Remember, if you’re worried about an allergic reaction, you need to seek medical advice. Salt or sugar. This helps set the child’s threshold for sweet and salty tastes later in life; it helps avoid dental caries (decay) and it doesn’t over-load the immature kidneys with lots of salt. Cows’ milk as a main drink. It’s fine to have cows’ milk in part of a meal e.g. in mashed potato or as yoghurt. Honey. Honey can contain the spores of botulinum (botox) which occurs naturally in the environment and is a muscle relaxant (hence why when you inject it into your forehead you don’t have any wrinkles because you can’t move your muscles.) However, if you ingest it, it can stop your respiratory muscles and you stop breathing. If the honey has been treated using high-pressure and high-temperature treatments, it should inactivate the spores but it might just be easier to avoid honey for a year. Shellfish, pate, blue cheese and soft cheeses with rinds like brie (rather than processed soft cheese that comes in a packet), soft eggs should only be given from 1 year. This is because this group of foods is good at harbouring bugs that can lead to food poisoning. Citrus fruit (it’s very acidic for young babies). It may sound as if your baby can hardly eat anything but it's surprisingly easy to cook a family meal that is baby-friendly. I hardly use any salt when I cook. (Your taste buds adapt to the amount of salt in things so it doesn't taste bland to me.) If you do want to use salt, you can always take out a portion for your baby first. Just remember to take chocolate pudding off the menu!